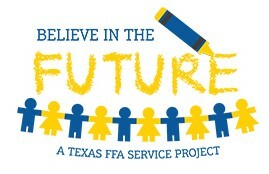 The Texas FFA Association embraces the idea of building stronger communities. The last line of the FFA motto, “Living to Serve,” signifies the vital role service plays in our organization. The 2018-2019 Texas FFA Officers are working to coordinate a three-tier community service project that will take place at three events throughout the year: the State LDE Contest, State Leadership Conference, and State Convention. The Texas FFA Association is excited to collect new or gently used children’s coats for the Good Shepherd Mission in Huntsville, Texas, the host city of the State LDE Contest. Chapters are encouraged to bring donations to the contest and deposit them in the SHSU Lowman Student Center Ballroom. For more information, please see this flyer. If you have any questions, feel free to call the Texas FFA Association office at 512.480.8045.